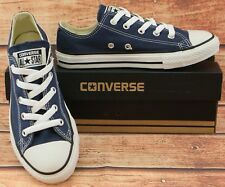 Unisex Children’s Chuck Taylor Converse All Star Trainers Size 1 Navy Blue. - Sole: Gum Rubber. - Trademark All Star Logo. We make buying online as simple as it can be. - Heel Type: Flat. 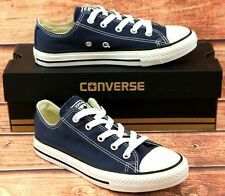 Unisex Children’s Chuck Taylor Converse All Star Trainers Size 10 Navy Blue. - Sole: Gum Rubber. - Trademark All Star Logo. We make buying online as simple as it can be. - Heel Type: Flat. Boys shoes bundle size 10 these shoes fit my son age 4-5 yrs approx. Minions velcro strap sandels Crocodile rubber slip on beach/garden sandals like crocs Black and yellow lace up converse pumps Condition is Used on all 3 items but plenty of wear left in them ideal for summer, preschool on the beach Dispatched with Royal Mail 2nd class. The durable rubber sole stands for durability and long-lasting comfort. 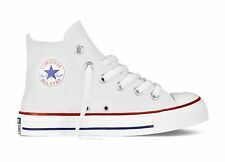 The Converse All Star logo on the heel rounds off the trendy style. - Abrasion resistant rubber sole. We make buying online as simple as it can be. I’m selling a used unisex infant triple black converse all star high top without box which are in very good condition as seen in the pictures if you have any questions don’t hesitate to contact me and please leave your generous feedback thanks.Uk delivery only. Boys navy converse Size 1 BNWOB. Dispatched with Royal Mail 2nd Class. Condition used but in good condition. Good condition. Boys Converse Size 13. Condition is Used. Boys Navy Canvas Converse Size 3. Perfect for summer with trousers or shorts. With box. Brand New With Box - Baby Boys Olive Green Converse Trainers - Infant Size 6. Condition is New with box. Dispatched with Royal Mail 1st Class. 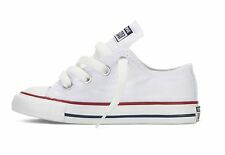 Classic converse white trainers size infant 7 in really good condition hardly worn but noticed odd marks on them see picture. Boys White Hi Top Converse Trainers Size 9. Condition is Used. Only been worn once. Dispatched with Royal Mail 2nd Class. Worn but pretty good condition General marks but nothing noticeable Infant Converse Size 6 White Leather Effect Boys Girls Unisex. Condition is Used. Dispatched with Royal Mail 2nd Class. The Converse double tongue chuck is twice as tempting so go ahead: stick 'em out. Canvas upper with two tongues. Matching accent foxing stripe to tie it all together. Golden glow lining. All Star logo patch on the inner tongue and the heel tab. Infants size 8 (EU 24) black Converse. In good clean condition, rear badges faded slightly, clean inside and good soles.